Promar consultants often go in the field (literally!) in order to assist clients in solving business dilemmas. Senior Consultant Tina Peneva tells about her experience in solving a raw material supply issue in Bulgaria. Safflower (Carthamus tinctorius) is an annual oilseed crop that resembles a thistle. Its seeds are rich in oil and the flowers are used for the manufacture of yellow dyes. It is not a major crop and the global safflower production totals about 500,000 MT annually. There are more than 60 countries involved in safflower production, the largest ones being India, USA, Mexico, as well as China, Kazakhstan and Ethiopia. In addition to its more traditional end uses for oil and for birdseed, in the past 10 years safflower seeds have increasingly been used in food supplements, including Bulgarian seeds. 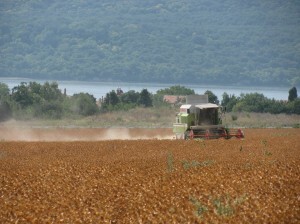 Overall, Bulgaria supplies just a small share of the global safflower production. 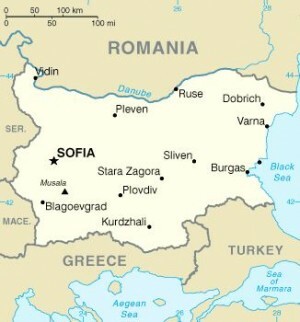 The majority of Bulgarian safflower is marketed mainly as bird feed. However, premium quality safflower seeds can be used for human consumption and food supplement production. Producing safflower seeds for human consumption requires very careful post-harvest handling in order to avoid the growth of aflatoxin mold which is dangerous for humans. 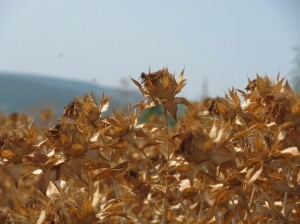 In Promar’s case, the safflower exporter and importer faced various difficulties, right from the initial phase of safflower sourcing from Bulgaria. The Bulgarian side could not understand the strict requirements the Japanese buyer laid out in regard to harvesting, storage and transportation of safflower. On the other hand, the Japanese buyer was not able to have hands-on control over the process in Bulgaria due to distance, as well as a shortage of manpower. These major communication problems and lack of a person in charge of quality control were threatening to derail the project. When Promar Consulting stepped in, we first made sure that “everybody was speaking the same language”, i.e. there were no information gaps or unclear points in terms of what the Japanese buyer’s requirements were and whether the requirements were achievable. The most important challenge in the process was to prevent aflatoxin mold from growing in the harvested safflower, which would make the seeds unusable for human consumption. After a number of meetings and discussions, the project team including the importer, the exporter and Promar consultants outlined a traceability system for monitoring the pre-harvest, harvest and post-harvest handling of safflower seeds before they are exported. The traceability system included clear actions at each step that were meticulously recorded for future analysis. We prepared detailed check lists to be completed by the Bulgarian exporter with details about the agrochemical product use, soil treatment, the condition of the harvesting combine and the transporting truck, weather details, among other points. Promar consultants facilitated this process and made sure the tasks were understood correctly and completed in a timely manner. As usually happens in agriculture, the exact harvest period is hard to predict. This was one of the difficulties that the overseas safflower buyer facedl; it was impossible to fly over to Bulgaria on short notice to directly monitor the safflower harvest. Instead, our Bulgaria-based consultant was on stand-by for a week prior to harvest, waiting to be called to observe the harvest at the best possible, i.e. the driest, time. During the harvest, we recorded each step of the process, including keeping track of atmospheric temperature, and humidity. This information was necessary in order to track any possibility of aflatoxin mold growth during the harvest. Promar’s involvement in the post-harvest processes included documenting and monitoring the safflower cleaning and drying process at the cleaning facility, as well as putting the seeds into bags and preparing them for storage. 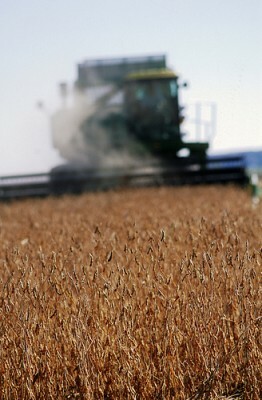 During this process our consultant took seed samples which were sent for analysis prior shipment. The joint effort between buyer, seller and Promar consultants proved to be efficient on many levels. Communication was smooth, since gaps in language and business culture were eliminated. All parties involved better understood the buyer’s requirements and therefore followed them closely, which resulted in a successful harvest of safflower seeds from Bulgaria. Promar has done numerous projects assisting companies, industrial organizations and farmers in solving supply issues. If you are interested in learning more, please contact us. Beer gardens in Cambodia are filled with the sounds of beer glasses almost constantly clinking, vibrant chatter among friends, and the banter of beer promotion girls making sales rounds. Cambodia’s beer market may be small, but it is a vibrant one, and like other emerging beer markets such as Myanmar and Laos, Cambodia is poised to show strong growth over the coming years. 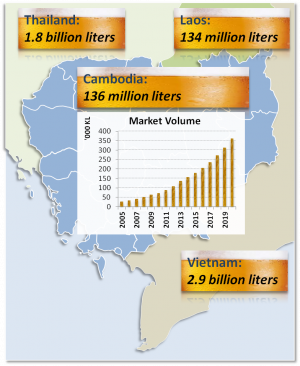 Cambodia is sandwiched between South East Asia’s largest beer markets of Vietnam (2.9 billion liters) and Thailand (1.8 billion liters), and is the fifth largest beer market in the region with an estimated 136 million liters, putting it just ahead of neighbor Laos. Growth rates for Cambodia are thought to be near 20% for the past three years. 72% of Cambodia’s 136 million liters beers is brewed domestically. The market is dominated by Cambrew, a subsidiary of Carlsberg A/S, who is the no.1 brewer in the Cambodian beer market with its flagship brand Angkor beer, named after the world renowned Angkor Wat temple. Cambodia Beer Limited (CBL), established in 1996 and backed by Dutch beer giant Heineken, is the main competition and it brews Anchor beer as well as ABC and Tiger beer plus the economy price-point beer Golden Crown in its factory just southwest of Phnom Penh, off National Highway 1. Together, Cambrew and CBL hold an estimated 82% of the beer brewed domestically, and battle each other through consumer-targeted marketing and trade promotion for market share at on and off-premise outlets. Newer market entrant Khmer Brewery Limited (Cambodia beer) is giving the two giants some serious competition, and smaller breweries like Kingdom Breweries and Ganzberg are also trying to move into the market. Cambodia also has plenty of imported beer – 28% of the beer market comes from oversees – mostly Thailand and Vietnam. Legal beer imports in 2013 amounted to 7.7 million liters, but it is estimated that 5 times more came across the borders unofficially. Import beer brands in Cambodia are diverse, both in flavor, and price-point. Among premium beers, Heineken and Budweiser, both imported by local distributors under exclusive handling contracts are quite prevalent at modern and traditional retail outlets through the country. Heineken and Budweiser bottles (330ml) are usually sold retail for USD 1.40. Both of these brands are also currently making a big push to target Khmer premium on-premise outlets. Standard and economy brands from Vietnam, Thailand and Laos are increasingly found in the market. For example, Leo beer, brewed by Singha in Thailand, is currently popular with younger drinkers in Phnom Penh. The brand’s popularity can be linked to its affordability (USD 0.55/330ml can) as well as the strong marketing presence behind the brand. Even renowned Belgian beers like Maredsous Brune and Duvel can be found at some high-end off-premise locations in the capital, albeit retailing at close to 6 times the price of a Heineken. Cambodia’s imported beer market is likely to grow in-step with overall market growth, and benefit from tariff reductions scheduled for 2015 as agreed to by ASEAN countries. The market drivers behind the growth of the Cambodian beer market are social, economic and industry driven. Socially, beer drinking in Cambodia is no longer entirely male dominated. Now, beer consumers increasingly include both men and women. In addition to a shifting gender balance, the typical drinker age profile is also changing, and more young people are enjoying beer. It is hard to pinpoint an exact reason as to why more women and young people are drinking. One theory is that, mixed-group drinking is growing in popularity partly as a result of the heightened prevalence of on-premise outlets in Cambodia, such as daytime clubs popular with high school students and beer restaurants popular with men and women alike. As for economic drivers, growing household incomes are certainly expected to support people’s power to purchase beer. Lastly, the market’s competitive nature itself is serving as a driver. Beer companies in Cambodia are upping their brew capacity and output, spending more on marketing, and growing their distribution muscle in retail, restaurants and beer gardens. Cambodia’s beer market is small, but it is vibrant, and is showing great potential for growth. Looking forward, we can expect heated competition for increased market share from local brewers, as well as an increase in beer imports, especially from Thailand, which will certainly boost the volume of beer available in the market. More beer and steadily increasing spending on consumption will also support the market favorably. Lastly, with younger people enjoying beer, the number of potential beer drinkers in Cambodia is increasing as beer drinking shifts from a pastime of the middle aged to an inclusive form of social recreation. Promar Consulting has done numerous projects investigating various agriculture, food and beverage markets in Southeast Asia. If you are interested in learning more, please contact us. If you mention the trendy term “super fruit” in Korea, it is more than likely that “blueberry” will be the first word that pops up. Blueberries have become incredibly popular in South Korea for their health benefits in a very short time and can be considered a success story for blueberry suppliers, which are dominated by the US, Canada and Chile. Blueberries began their growth only about 4 years ago, and they are still considered to be a fairly new product in the Korean fruit market. This so-called “blueberry boom” started in 2009 when a TV show featured the health benefit of blueberries, with emphasis on the positive effect of blueberries on vision. This TV show drew great attention from the public, and within a year, blueberry imports had increased over 6-fold. 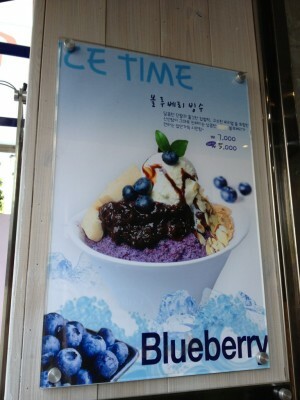 The blueberry demand has continued to grow and by 2012, imported frozen blueberries to South Korea were 10 times the volume they were in 2009. While supermarkets are still the main channel for frozen blueberry distribution, TV shopping channels are, surprisingly, a major distribution channel for this trendy berry. Unlike other Asian countries where TV shopping is considered monotonous and dull programming, in Korea, TV shopping channel viewership has been growing among all age groups, primarily because of the channels’ flamboyant and entertaining presentations of products. As Promar learned in discussions with the Korean shopping channels, they have been able to enjoy strong sales of frozen blueberries by emphasizing the blueberries’ benefits for vision and their anti-aging effect due to the high level of antioxidant. Koreans, known for their healthy fermented “kimchi” pickles and ginseng, have always known to be health conscious, and for this reason, blueberries sales are forecast to continue its growth as more consumers become aware of the health benefits and continue to want blueberries for their smoothies and yogurts. However booms come and go and it will be interesting to see where blueberries stand in the Korean market after another 4 years. Can they further extend their share, finding popular uses outside of smoothies and yogurt? Or will they be replaced by another health product boom? Promar Consulting has extensive experience studying South Korean food, seafood and beverage markets. If you are interested in learning more, please contact us. Vietnam has no end of tasty street snacks, the country’s traditional fast food, from pho noodles, to grilled chicken skewers to bahn mi baguette sandwiches. Rumor has it that this strong tradition of high quality, low cost traditional fast food was one reason that Western fast food chains have been slow to enter the country. Until 2010, KFC was the main Western player, with only few others starting to test the market. However, since 2010 Vietnam has seen a fast food boom, with major chains like Pizza Hut, Domino’s, Popeye’s, Burger King, Carl’s Jr, Subway and Coffee Bean and Tea Leaf entering the Vietnamese fast food market. At the same time strong local competitors such as Highlands Coffee and Trung Nguyen Coffee are building a modern coffee culture, usually starting in Ho Chi Minh City, and then moving to Hanoi and other major cities. The competition from cheaper traditional street food has been major factor in the marketing positioning that almost all Western chains have taken, with most of them choosing to go premium. Prices target higher end consumers: Pizza Hut offers extensive menus, silverware and waitstaff (a strategy that is working well in China) making it a popular date destination. Other fast food chains in Vietnam cater to kids and young middle class Vietnamese families will make a fast food visit the focus of the afternoon. Wi-Fi is free and coffee at the Western cafes is as much as 5 times the price of a street vendor. And yet the shops do brisk business. This is about a lifestyle – being seen at these shops is as important as actually eating the food. However in addition to competition from “traditional fast food”, two other factors that limit fast food growth are real estate and infrastructure. 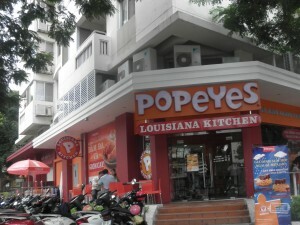 The cafes and fast food chains which pitch themselves as premium must locate their shops in premium areas, such as District 1 in Ho Chi Minh City (HCMC) or higher-end office parks in District 7. Ideally they want real estate on the corner of a busy and trendy area. These spots are going fast and many chains are finding it difficult to find affordable real estate that offers the right kind of exposure. The second problem is infrastructure, particularly cold chain and transportation. Chains like Burger King who uses cheese, Popeye’s which uses fresh chicken and KFC with its frozen chicken need warehouses, central kitchens and ingredient sources that are reliable and nearby. So far this has limited most fast food chains to HCMC and Hanoi where they build their own central kitchens and warehouses. In looking at the list of fast food and café giants now tumbling into Vietnam one after the other, two major names seem to be missing: Starbucks and McDonalds. The wait is now over. Starbucks opened its flagship store in HCMC in February, a huge shop that gives you a Wi-Fi password with your order. It has a trendy high-ceiling industrial design that could be anywhere in Soho. A second shop just opened last week. McDonald’s has announced that it will be opening a store in the next few months and it is expected to expand rapidly. Vietnamese consumers are very curious about the brand and there is real excitement. Many in the Vietnam food industry think that McDonald’s entry will have a major impact on the Vietnam restaurant industry, from sourcing and operations style to marketing and promotion capability. In fact, Promar’s on-the-ground research into the Vietnamese fast food market, conducted earlier this month, indicated that the entry of Starbucks and McDonald’s is already having an impact. Trendy local café chain Highlands Coffee has removed many of the western food items, like sandwiches, from its menu, which they say was done in order to differentiate from Starbucks and maintain an identity of “modern Vietnamese”. Burger King, which has only recently started to expand from its flagship store in the international airport, also admitted that McDonald’s entry into Vietnam will be a test for all burger chains to really strengthen and differentiate their brands in order to survive. Every six months reveals a new café and fast food landscape in Vietnam. New players, failed players, new marketing, aspirational design and, slowly, more localization of menus. No doubt six months from now the Vietnamese café and fast food industry will have taken another step forward in its amazingly rapid development. 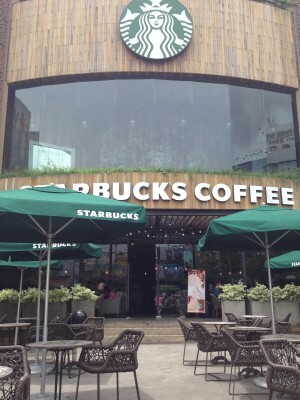 Photo 2: Starbucks flagship store opened in February 2013 in Ho Chi Minh City; prime real estate on a busy intersection. Promar has done numerous projects in Vietnam and Southeast Asia in the growing fast food, cafe and bakery markets. If you are interested in learning more, please contact us. 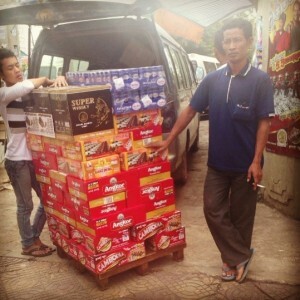 Until just a few months ago, buying a Coke in Myanmar meant purchasing a can that was smuggled in from Thailand. However, this is all changing as global food and beverage companies are now some of the most aggressive investors in Asia’s last frontier market. Following the 2010 elections, a new government headed by Thein Sein began various political and economic transformations which opened the country to the world and stimulated significant economic changes in Myanmar. This paved the way for large investments in Myanmar’s beverage market from companies like Coke, Pepsi, Heineken, Carlsberg and Unilever. Nevertheless, while investors are excited about the prospects of Myanmar’s increasingly liberalized market with its potential for growth, committing capital to Myanmar is not an easy thing to do. In addition to continuous challenges pertaining to Myanmar’s economy and infrastructure, one of the biggest hurdles faced by global companies entering Myanmar is the lack of transparency in the business sphere. Successful market entry – even for giants like Coke and Pepsi – requires working with a local company. And while there are many strong Myanmar companies which can provide foreign investors with access to knowledge and know-how of the local market, these partnerships come at the price of having to work with opaque companies, many of which are still linked in some way to the economic arm of Myanmar’s Ministry of Defense. 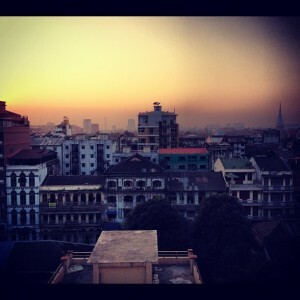 The business challenges are indeed significant in Myanmar, but so are the opportunities. Myanmar’s economy has the potential to quadruple its current levels and surpass 200 billion USD over the next 20 years. Myanmar’s consumer class is expected to grow rapidly from its current levels of around 4 million to reach 20 million in 2030, with spending expected to jump from 35 to 100 billion USD over the same period. Moreover, in addition to being the 5th largest country in Southeast Asia with a population of close to 65 million, Myanmar is wedged between the world’s two most populous countries, China and India, placing it in a vital geographic position amid Asia’s emerging consumer hubs. While the reemergence of Myanmar into the global economy does warrant optimism, it is still a place of many unknowns. Is the country really stable? Some would say yes, as the country takes major steps away from a military dictatorship towards a more open political system. These optimistic feelings can be confirmed by the buzz on the city streets and in the tea shops of Yangon where people talk with great enthusiasm about the future and profess the impossibility of going back to the “old ways”. However, internal destabilizing factors like ongoing deadly clashes between Myanmar’s Buddhist majority and Muslim minority, and the fact that Myanmar’s military past is still very present and interwoven into the fabric of the country’s political and business realms are an ongoing issue to monitor. How soon can Myanmar’s business sector escape from the shadows of the country’s military past and reach its potential as a transparent partner of global food and beverage companies? It is a transformation we will be watching carefully. Despite the fact that India is traditionally a tea country, coffee consumption growth is outpacing that of tea, and is being driven forward by the country’s growing middle class and younger consumers. Demand for tea in India is still strong as it is consumed by 90% of Indian households, and quality tea can be found just about anywhere for just a few rupees. However, coffee has found its place among the nation’s youth and emerging middle class, largely owing to the rising popularity of modern coffee bars and cafés as hang-out spots. As India’s coffee boom has gone pan-Indian, coffee consumption in India has shown robust growth, rising by about 5%-6% annually, while tea consumption is increasing only at about 2%. Outlooks expect coffee and tea drinking growth rates to hold pace. A decade ago, the country’s coffee-drinking culture could largely be summed-up by the consumption of sweet and frothy filter coffee in South India. However, nowadays, Western-style coffee bars have sprouted up all over India as a newly emergent young middle class has become enchanted with cappuccinos and café lattes as much as they have fallen for the idea of catching up with friends and colleagues at cafés. Barista Coffee is considered to be the pioneer of espresso bars and cafés in India and has 1,950 outlets across the country. The second largest chain is Coffee Café Day, another ubiquitous Indian coffee bar chain, with 1,438 outlets across 28 states of India. Starbucks, through a joint venture with Tata Global Beverages, already has 15 outlets (8 in Mumbai and 7 in Delhi). Through extensive fieldwork in end-channels across all income levels in six major Indian cities, , Promar consultants recently learned that India’s blossoming coffee culture is also paving the way for ready-to-drink coffee beverages and in the process of doing so is changing the landscape of the soft drink industry in India. Nescafé Ice Coffee is a chocolate mocha-flavored coffee beverage and is the leading RTD coffee brand in the country. The category – which currently groups RTD tea and coffees together – still accounts for just 0.1% of India’s 9bln liter soft drink market but is expected to become the fastest growing category over the next five years. RTD tea and coffee drinks, in terms of absolute volume, are expected to hit the 47.8mln mark in 2016, up from their current levels of just 16mln liters. 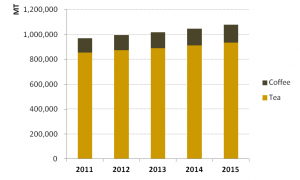 Category growth is likely to push RTD tea and coffee drinks from being the 6th to the 5th largest category in the market, trailing only water, two carbonated categories, and juices, over the forecast period. Given the novelty of the RTD coffee category, companies are experimenting with products in order to find a hit with Indian coffee consumers. 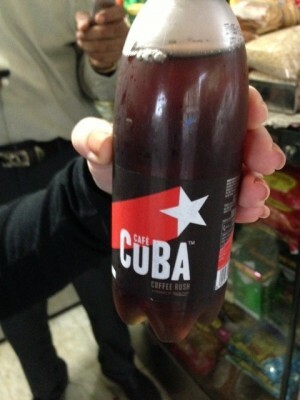 For example, Indian soft drink company Parle Agro has recently made a foray into the RTD coffee market with its newly released non-caffeinated carbonated coffee-flavored beverage called Café Cuba. Other companies such as Coke, Pepsi, Unilever and Nestle are expected to also be considering variants of RTD coffee products. While the conclusion can be made that India is still not likely to become a coffee country, the popularity of cafés and their delicacies, as well as various other forms of instant and RTD coffee drinks are on the rise, and are becoming increasingly popular with India’s growing middle class consumer segment. It will certainly be interesting to see where the Indian coffee market goes from here. Promar Consulting has done numerous projects investigating various agriculture, food and beverage markets in India. If you are interested in learning more, please contact us. While sashimi (raw sliced seafood) has long been popular in Japan, salmon has only recently become part of the Japanese sashimi menu. It is only in the last 20 years, when farm-raised Atlantic salmon from Norway and then salmon trout from Chile began to appear in Japanese markets, that salmon sashimi began to be eaten in Japan. While Japan has long been a salmon eating country, its native salmon are wild and generally not safe for raw sashimi consumption due to parasites. Salmon has been steadily pushing into the Japanese sashimi market and slowly taking share in this otherwise very traditional and very static market. The Japanese retail sashimi market is a market dominated by tuna (30% share) and a handful of familiar white fish (sea bream, yellowtail, squid and others). 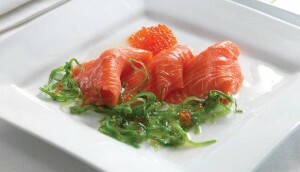 Within this traditional market, salmon has proven to be a completely different and modern product. While the other sashimi fish are almost always served with soy sauce and wasabi, salmon has successfully been sold with “unconventional” ingredients such as chopped onion, salad dressing, mayonnaise, etc. It can be seen in the retail sashimi corner as carpaccio or slightly seared. Due to the dynamic and unconventional uses of salmon in Japan, as well as a general appreciation of salmon among children and young people, who first encountered salmon at Japan’s ubiquitous “conveyor belt sushi” restaurants, the composition of the Japanese retail sashimi section has been changing. Sashimi sales in supermarkets and hypermarkets overall have been flat over the past decade – salmon alone has been steadily growing and is solely responsible for the growth of the Japanese sashimi market in the past few years. In fact, last year was Norwegian and Chilean salmon’s biggest year in terms of imports and sales in Japan. The main reasons for this boom are the steady demand for salmon in Japan as well as a decrease in the import price, which coincided with a price increase for tuna, which is considered to be sashimi salmon’s biggest rival. This salmon sashimi boom can be considered a bright spot in Japan’s fish market which overall has been declining in volume year by year, as more Japanese consumers turn away from fish in favor of meats and other protein. Salmon sashimi may still receive mixed reviews from older Japanese who did not grow up eating salmon raw, the great enthusiasm for raw salmon among children and younger women in particular suggests that salmon will continue to have opportunities in the Japanese sashimi market. It may have a ways to go before it can catch up to tuna in the sashimi market, but the acceptance of salmon as “unconventional” ingredient ultimately gives it much more flexibility in the Japanese sashimi market than tuna has ever had. Promar Consulting has investigated a variety of aspects of seafood markets and fisheries issues in Japan and other regions. If you are interested in knowing more please contact us. In Promar’s recent research on the Japanese fruit market, we learned that three primary factors tend to influence Japanese consumers’ fruit consumption habits: seasonality, ease of preparation, and consumers’ age. Seasonality is of utmost importance to Japanese consumers. 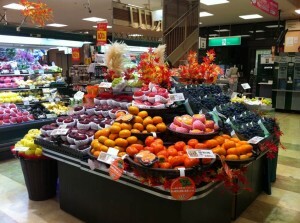 Fresh, in-season fruit is showcased in stores, appealing to customers who value “shun”, or the “peak season”. In summer, fruit such as apricots, peaches, grapes, cherries and watermelon abound, whereas winter is citrus season in Japan – bringing with it mikan, iyokan, dekopon, and other varieties of mandarins or mandarin-like citrus fruits. Unlike domestic fruits, imported fruits’ seasonality is often not highlighted by retailers, and consumers are thus largely unaware and unconcerned of the seasons of imported fruits. However, due to the sheer variety of domestic offerings on the Japanese fruit market, imported fruits in general may find the staunchest competition in June through August, and imported citrus from December through March. Secondly, easy preparation proved an important draw in attracting Japanese consumers, especially with – though not limited to – younger generations. Fruits that can be washed and consumed immediately, or easily peeled without a knife, are immensely popular. Japanese consumers of all age groups purchase apples, mikan (mandarin oranges) and bananas most heavily, with strawberries, other domestic citrus fruits and grapes following behind; none of which require cutting before consumption. Survey respondents indicated that one key reason they did not purchase fruits was that fruit is time-consuming to prepare. Fruits requiring cutting of some kind before eating – oranges, grapefruits, persimmons, kiwis, and peaches – were the least popular with Japanese consumers in terms of annual household expenditure devoted to each fruit. Finally, it is important to note that Japanese consumers’ fruit consumption habits vary enormously by age. The youngest and oldest generations are by far the heaviest consumers of fruit, with those aged 6 years old and below eating an average of 104 grams of fruit per day, and those aged 60 and above around 142 grams per day. By contrast, those in their 20s consume a mere 61 grams of fruit per day (the equivalent of around half a grapefruit). A shocking 7.2% of poll respondents in their 20s claimed to never consume fruits at all, earning the younger generations the label of being fruit-banare, or fruit-shunning. However, while Japanese consumers in their 30s do not consume significantly more fruit than those in their 20s, they tend to purchase more for their households. Fruit is strongly associated with health and nutrition in Japan, and it appears that the vast majority of Japanese fruit buyers are either purchasing it for their own health or that of their children. Those interested in entering the Japanese fruit market must understand how seasonality, ease of preparation (or lack thereof), and consumers’ age factor into purchasing decisions. Promar Consulting has investigated a variety of aspects of the fresh fruit market in Japan and other regions. If you are interested in knowing more please contact us. Promar has been providing weekly updates on China’s soybean market for the past 3 years. Over this summer, the focus of the weekly newsletters has been on how this year’s severe drought in the US, the most widespread drought in 56 years, has significantly reduced US soybean production, which in turn has driven up world soybean prices and has forced the Chinese government to release its own reserves to keep domestic soybean prices down. Given that China is currently the world’s largest importer of US soybeans, the Chinese domestic market has been hit hard by the shortage of US supply. In order to meet demand, the China Grain Reserves Corp, the state stockpile agency, is currently offering 400,000 tons of soybeans from state reserves on a bi-weekly basis. During the last week of August, Chinese crushers bought approximately 400,000 tons of soybeans from the government, indicating that the domestic market continues to rely heavily on the government’s reserves. China’s domestic production has its own issues as well. The acreage devoted to soybean planting is shrinking for the third consecutive year as increasing numbers of Chinese farmers shift production to corn – a comparatively more lucrative crop. Poor weather conditions and pest problems in key soy bean producing provinces such as Heilongjian, located at Northeastern China, have also negatively impacted the production yield. Promar predicts the Chinese government’s fear of inflation stemming from the possibility of higher food prices will continue to force the Chinese government to auction off beans and deplete state inventories. It will be interesting to see how the dynamics of China’s soybean market unfolds in the upcoming months as China decides how to replenish its state soy reserves.